March 16 marks 15 years since Rachel Corrie was killed. She died putting her body between a bulldozer and a home she was trying to protect in Gaza. She has inspired so many and we salute her and those who carry on her legacy. 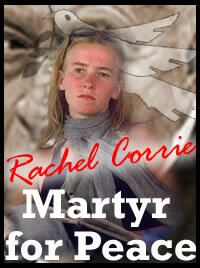 March 16th marked the anniversary of the Israeli killing of Rachel Corrie in Rafah, southern Gaza strip, 14 years ago. 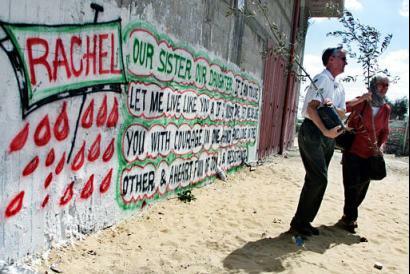 On March 16, 2003, Rachel was killed by an Israel Occupation Force (IOF) armored bulldozer in Rafah during the second Palestinian intifada. Rachel had come to Gaza to try and establish a sister city project between her hometown Olympia, Washington and Rafah, Gaza. She was a peace activist connected to the International Solidarity Movement (ISM), who tried to prevent the demolition of Palestinian houses which were being carried out by the Israeli army. After a three hour long confrontation between ISM activists and the Israeli army’s demolition forces, she was killed, less than two months after arriving in Gaza. Israel claims that the driver of the bulldozer could not see Rachel because of the limited field of view from within the bulldozer. Humans rights groups claim that the driver had seen her and deliberately continued driving, disregarding her fellow activists who were shouting and waving their arms, which resulted in Rachel’s death. The Israeli army’s investigation of the incident concluded that the death was an accident because the driver of the bulldozer had limited visibility and therefore couldn’t see Rachel. Amnesty International and other human rights organizations criticized the military investigation, claiming that it was not transparent, credible or thorough enough. In 2005 a one-woman drama called ”My Name Is Rachel Corrie” ran at London’s Royal Court Theater, and received a warm reception. In April 2015, the drama was staged Off Broadway in the East Village in New York. Two years ago a symbolic gravestone with her name was installed in Tehran cemetary in Iran, alongside twelve other symbolic gravestones. There is a street named after Rachel Corrie in Ramallah, West Bank. Rachel must never be forgotten and her murderers must never be forgiven! Her dreams will live on till ALL of humanity is free! Soldier! Improve your appearance! Always remember: You are the face of the IDF. So improve your appearance – online! The wrongful death lawsuit for Rachel Corrie was not a solution, but rather a symptom of a broken system of accountability within Israel and the U.S. government, writes guest columnist Cindy Corrie. 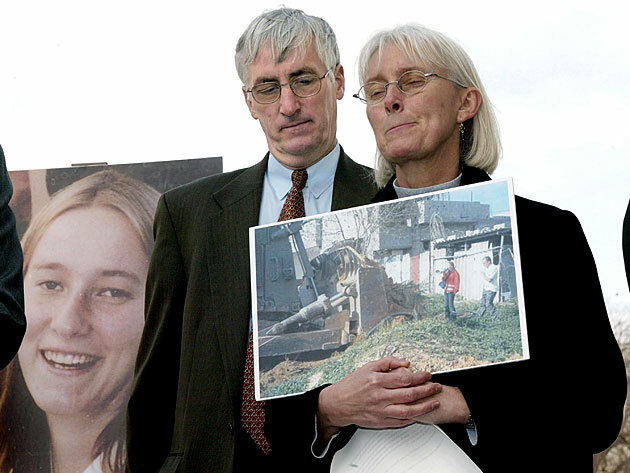 LAST month, in a deeply disturbing ruling, an Israeli court dismissed the civil lawsuit brought by my family against the state of Israel for the wrongful death of my daughter Rachel Corrie. Born and raised in Olympia, Rachel was a human-rights defender and peace activist killed in 2003 by an armored Israeli military bulldozer as she stood for hours, visibly and nonviolently protesting the Israeli government’s policy of civilian home demolitions in Rafah, Gaza. The home Rachel and her friends from the International Solidarity Movement defended was eventually demolished with hundreds more in mass-clearing operations to create a buffer along Gaza’s southern border. Court testimony also confirmed a credible investigation did not occur. Investigators failed to question key military witnesses, including those recording communications; failed to secure the military video, allowing it to be taken for nearly a week by senior commanders with only segments submitted to court; failed to address conflicting soldiers’ testimonies; and ignored damning statements in the military log confirming a “shoot to kill” order and command mentality to continue work in order not to create a precedent with activists. I had no illusions about the uphill battle we faced in Israeli court, but as I sat with my family in a packed courtroom awaiting the verdict, I held hope that, like so many observing the trial, the judge would see that evidence warranted some criticism of the military’s actions. The room was filled with human-rights observers, U.S. Embassy officials, family supporters and a throng of media. Judge Oded Gershon surveyed the scene before reading his decision. From the halting tone of my translator and friend, and audible groans around us, I knew it was bad. He ruled that Rachel was killed as an act of war, which, according to Israeli law, absolves the military of responsibility. He added that she alone was to blame for her own killing and then went on to commend the military police for their professionalism in carrying out such a credible investigation. The courtroom heard the judge parrot the state prosecuting attorneys’ original claims in the case, nearly verbatim. Condemnation of the verdict was swift and decisive, ranging from President Jimmy Carter to the United Nations, Human Rights Watch, Amnesty International and others, all pointing out the climate of impunity enjoyed by the Israeli military, as well as the court thumbing its nose at the Geneva Conventions. The verdict sends a dangerous message for future protections of civilians and human-rights observers. The outcry was humbling, but the verdict represents a very personal challenge. With 45 days to determine whether to appeal, I weigh heavily the toll this ongoing effort takes. Our nearly decadelong search for information and a modicum of justice has turned into a war of attrition — a state versus a family. As problematic as the process has been, our family has had access to a legal system, a basic tenet of justice most Palestinians are denied. They struggle, far harder than we, for their day in court. We have sought truth, but also changes in policies Rachel came to Gaza to oppose — brutal Israeli military actions often targeting civilian populations resulting in unlawful killings and destruction of property with impunity. An Israeli colonel testified there are no civilians in war. Rachel was in Gaza because there are civilians there with rights to be protected. No army is above the law when it comes to protection of civilians under occupation or during armed conflict. Rachel taught us that when governments fail to act, people must step forward. When atrocities are committed in our name, we must shine a spotlight on them. Our family will determine the next critical steps with Rachel’s spirit surrounding us. Our journey continues, alongside those who, despite the odds, pursue equal rights and nonviolence, human rights, peace and justice for all in the region and world beyond. *Cindy Corrie is the mother of Rachel Corrie and the president of the Rachel Corrie Foundation for Peace and Justice based in Olympia. They died so Palestine can live! Such occasions make us cry but also because we start to remember others: the first three that came to my mind were Vittorio Arrigoni, Bassem and Jawaher Aburahma, then to be followed by a flood of faces and names. When will this injustice end and the murders stop? It is hard to believe that we lost Rachel Corrie in March 2003. Our pain makes it feel like only yesterday especially when this week a consistently biased lying Israeli judge justified his unjust verdict exonerating her killers by vilifying the International Solidarity Movement (see links below). As a Palestinian who happens to also hold a US passport and most importantly as a human being, I found the silence of the Obama administration on the murder of a US citizen particularly revealing. Such occasions make us cry but also because we start to remember others: the first three that came to my mind were Vittorio Arrigoni, Bassem and Jawaher Aburahma, then to be followed by a flood of faces and names. When will this injustice end and the murders stop? As for hundreds of years, colossal injustices must be and are answered by people. Not just in the case of Rachel but the tens of thousands of civilians murdered since the beginning of the Zionist invasion of Palestine. In a short while we commemorate the massacres of Sabra and Shatila where over 1300 Palestinian refugees and Lebanese were brutally murdered by mercenaries of the Israeli state in 1982 (see). In the subsequent 30 years, with US direct and indirect support, the killing spree continues and the ethnic cleansing continues. 7 million of us are now refugees or displaced people. In the middle of this darkness always come bright lights like Rachel and thousands of others.Rachel lived her ideals and taught us to live based on these ideals. In our last fleeting thought before we die, we never consider that we should have worked for more money or more power but we do think that the good that we do in life must have meant something. Rachel reminded us of this. Rachel’s good deeds and memory will live long after her killers and the Israeli judge die in obscurity. Her memory will live long after apartheid ends in Palestine and we have return and freedom. In that future, Muslims, Christians, Jews and others will join hands and hearts to remember this young girl and all the other martyrs along the way to equality and justice. And who is this divine? Is it misery and pain? DESPITE THE VERDICT, RACHEL CORRIE WAS MURDERED BY ISRAEL! And that my friends is a FACT!! Two days ago, a Haifa court ruled that Corrie was responsible for her own death. That was a sad day for justice and for international law, and as her parents said; it should also be a sad day for Israel. It is the IDF’s duty, we must recall, among other things, to defend civilians in an occupied area. Even if the driver of the bulldozer and the soldier sitting next to him did not see Corrie, and did not deliberately run over her, as the court found, the IDF did not do enough to prevent her being killed. The message from the Rachel Corrie verdict is clear: Israel doesn’t want people of conscience at a time when it is doing mischief. They are risking their lives. The spring of 2003 was an atrocious spring. An intifada was raging in the streets of Israel; explosives were going off next to the Gaza-Egyptian border, along the Philadelphi Route, and in Rafah, bulldozers mowed down hundreds of Palestinian homes, many of them belonging to innocent people. A few months earlier, a young American woman had arrived in Rafah from Olympia, Washington. Rachel Corrie had met a youth of Palestinian origin at her school and through him was exposed to the suffering of his people. At the age of 23, she decided to take some action. She joined the International Solidarity Movement and left for Gaza. During her first few weeks she witnessed the acts of the Israel Defense Forces in Gaza, reported them to her family and friends, and decided to act as a human shield. At that same time, two British citizens also arrived in Gaza – Tom Hurndall, another peace activist, and James Miller, an award-winning documentary filmmaker who came to make a film about what was happening in Gaza. He called it “Death in Gaza.” Within a number of weeks, all three of them had been killed by the IDF. Corrie was run over trying to save a house, with her own body, while a bulldozer tried to “expose” it. Miller was killed by a sniper when he came out of a house holding a white flag. After the first shot hit him, he still managed to shout out to the soldiers, “We are British journalists” – as can clearly be heard in the video filmed there in the dark; and then, in response, a second sniper shot was fired and killed him. Hurndall was killed while trying to serve as a human shield for a group of children that had entered an area where there was shoting. A British jury established that Miller had been murdered intentionally, but only the soldier who killed Hurndall was tried and sentenced to eight years’ imprisonment, then released after six years. No one was tried for the killings of Corrie and Miller. These three international activists were courageous people of conscience which any moral society would be proud of – shining examples of young people who are involved and care. While their friends spent their time at parties and doing nothing especially important, they came to the site of a humanitarian disaster. They did not endanger the soldiers of the IDF in any way but the army didn’t want them there. They got in the way of the army, in their attempt to prevent war crimes with their own bodies and to document them with their cameras. For those very same reasons that the IDF did not want them there, they had to be there. The spirit of the commander that could be sensed then (and now ) indicated that those volunteers must be chased away from the area. This ill wind also blew this week during the court ruling; its chill made its way to the solidarity movement and in this way indirectly sanctioned the killings. Corrie has become an international icon. It’s a shame there aren’t more Israeli youngsters like her. Her organization is not pro-Israel – far from that – its members are often dogmatic but that is their prerogative. The least that can be expected from Israel after she was killed, intentionally or by accident, was to bring those involved to trial, at least for negligence, to apologize and to pay compensation. In the case of Miller, perhaps the most obvious case of intentional killing, Israel paid a huge sum in compensation but, as was said, no one was brought to trial. This week, the judge in Haifa added his verdict to a long and embarrassing list of court rulings aimed at sanctioning almost every kind of improper act committed by the IDF. The message is clear: Israel doesn’t want people of conscience at a time when it is doing mischief. They are risking their lives. And the message to the soldiers is: It is permitted to kill them; nothing bad will happen to you. When the IDF acts in this way, it is perhaps possible to understand it, but when the judicial system sanctions this, it is depravity. Behold, Rachel, behold – your death was not in vain. It at least revealed , once again, that the Israeli judicial system is a partner to the foul deeds. In a ruling read out to the court, judge Oded Gershon called Corrie’s death a “regrettable accident”, but said the state was not responsible because the incident had occurred during what he termed a war-time situation. Family of Corrie, who was crushed by an IDF bulldozer during a pro-Palestinian protest in Gaza in 2003, filed lawsuit in Haifa accusing Israel of intentionally killing their 23-year-old daughter. The Haifa District Court rejected on Tuesday accusations that Israel was at fault over the death of American activist Rachel Corrie, who was crushed by an army bulldozer during a 2003 pro-Palestinian demonstration in Gaza. Corrie’s family had accused Israel of intentionally and unlawfully killing their 23-year-old daughter, launching a civil case in the northern Israeli city of Haifa after a military investigation had cleared the army of wrong-doing. 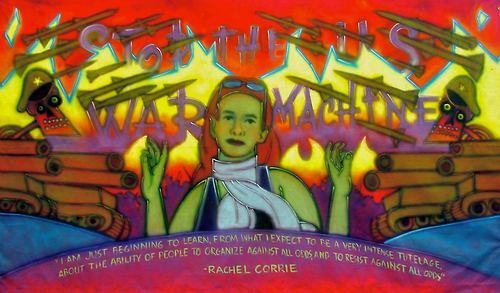 At the time of her death, during a Palestinian uprising, Corrie was protesting against Israel’s demolition of Palestinian homes in Rafah in the southern Gaza Strip. “I am hurt,” Corrie’s mother, Cindy, told reporters after the verdict was read. Corrie came from Olympic, Washington and was a volunteer with the pro-Palestinian International Solidarity Movement. Senior U.S. officials criticized the original military investigation into the case, saying it had been neither thorough nor credible. But the judge said the inquiry had been appropriate and pinned no blame on the army. Rachel Corrie, beautiful soul, born in Olympia, Washington was no ordinary child, no ordinary 23 year old student and no ordinary human being. And people, who are extraordinary, never die. They live for ever in the hearts and minds of their followers. They give direction to many and because of them, hope never dies. Because of such crazy and courageous, the ugliness of injustices is exposed. Her 5th grade speech ‘I am here because I care’ revealed no small dreams. At such a tender age, she talked of the oppressed, the poor and hungry and resolved to eradicate the ugly realities by the year 2000. As a student, she was different and wanted to explore the world especially after 9/11, year 2001. Ditching a beautiful and colourful American dream which she could have lived like many of her age, she travelled thousands of miles to Gaza to act as a human shield, where mercy and humanity is butchered every day and night, where men, women and children are murdered as a part of ethnic cleansing program, where houses are bulldozed, olive trees are cut, help including food and medicines from the rest of the world is denied and flotillas travelling to help humanity are attacked. On the day she died (16.03.2003), she was 23, dressed in a fluorescent orange vest and with a megaphone in her hand she was trying to stop the demolition of a Palestinian home where she lived with the children who were considered family by her and vice versa. She was mercilessly crushed under a military Caterpillar bulldozer which came towards her, knocked her down, crushed her with its blade, backed up, and ran her over again and she died shortly afterwards. ’My back is broken’ were her last words. What did she have in common with the Palestinian; faith, ethnicity, skin colour, language, social background? Absolutely nothing! What was common was humanity. She had eyes that could appreciate the truth, mind that wasn’t closed because of any bias, heart that would cry on injustice and brutality and a soul that would feel the pain of Nazi-style genocide. Her emails to her family are a must read in which she accounts Israeli atrocities towards innocent Palestinians. In 2003, Rachel’s news opened a new aspect of Palestinian cause to me. I learnt humanity existed above the boundaries of faith, ethnic origins and languages. I came to learn there are people on this earth who would risk their lives and everything for some other people despite absolutely no worldly strings attached between them. And it’s to date that I have explored a world that is cruel, unjust and merciless, but such people are a reason to live and resist. They give you direction, motivation and energy to challenge the ugly forces of the world. For me Rachel Corrie is not the name of a person. It’s a phenomenon which embodies humanity, resistance, courage and craziness. Yes, she was as crazy as it needs to be to shake the world and stir the plans of the handful of unjust men ruling this world. And it’s this craziness and madness which is the ultimate requirement to challenge falsehood and malice. Human beings live and die, but phenomena, missions and ideas never die. They’re like beacons of light for generations to come. Rachel Corrie, an American, a peace activist and a trailblazer, will always be my hero. 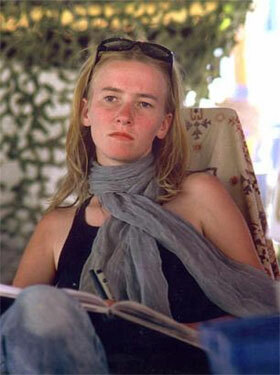 Rachel Corrie (b. 1979) was a member of the International Solidarity Movement (ISM). She went to occupied Gaza during the Second Intifada and joined protesters there. She died on 16th March, 2003.
and young Corrie’s watch-glass – with the sand running out. before a home to be flattened. with this woman in the way. and in the evening weep at his levity. Or is his an obscured view? 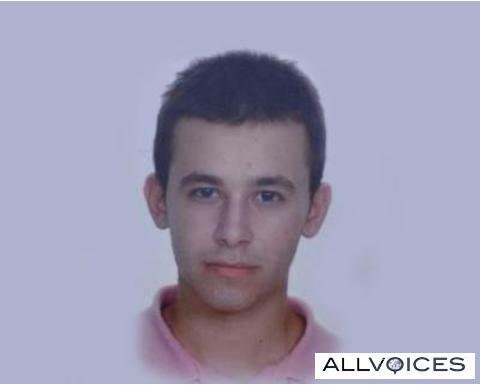 *Antony Johae, Ph.D. is British; he lives in Lebanon where he is writing freelance. Previously, he taught Literature in England, Ghana, Tunisia and Kuwait. “Rachel in Rafah, Gaza” comes from a recently completed collection entitled Poems of the East. from the smiling faces of children. and the memories of destroyed villages. repeating the most urgent of prayers. Then they come for the tears.. I tried to stop them! The flag I burned only yesterday! and took my life, my warrior blood! Just a week short of the 9th anniversary of the murder of Rachel Corrie, the zionist press had the audacity to defame her and make a mockery of her martyrdom. It is nothing less than SICK! Are they not satisfied that they killed her once already? Do they have to do it again?? Read it if you want … but have a barf bag ready at your side. Leave your comments on Ynet’s site… let them know how you feel about this. yet Obama just keeps sending more….. Authorities from Istanbul and Washington have confirmed that one of the nine people killed during an Israeli commando raid on the Gaza flotilla this week was a United States citizen of Turkish descent. As the funerals of Turkish citizens concluded today, June 3, 2010, the U.S. now faces a more complicated diplomatic position as the international community and the United Nations vent more frustration with Israel’s raid on the six ships’ foray trying to break a three-year-old naval blockade of the Gaza Strip. Nine bodies accompanied hundreds of activists that had been under Israeli guard since the detention of the ships on Monday, as Israel quickly released all of the detainees in an effort to quell the fervor of growing angst over the raid and sent them home by airline. Their efforts to rehabilitate the incident fell on deaf Turkish ears. Although one of the dead has been identified as an American, senior official declined to publically identify him by name. Washington has confirmed that the victim was American. The Turkish press however has identified Furkan Dogan, a 19-year-old, U.S. born citizen, who moved to Turkey after turning four. Dogan’s brother, Mustafa, said his parent had given the young activist their blessing before leaving with the flotilla, according to the Turkish daily Zaman. According to another news agency, Dogan suffered a shot in the chest and four bullets fired into his head from close range. On Thursday, the Israeli Foreign Ministry issued a statement that all the activists had been deported besides those requiring additional medical help. In addition, one of the injureds wife and two more that have been held for documentation abnormalities. The incident ignited early Monday morning when Israel sent its military commandos into international waters to stop the flotilla carrying humanitarian aid, including construction materials, toys and used clothes, to Gaza. The commandos boarded five ships without incident, but when they swooped in from helicopters onto the largest, the Mavi Marmara, soldiers opened fire when they said they were attacked by its passengers with chains, knives, bars and clubs. Another American family that knows the pain issued a statement as well….. The parents of an American activist killed in Gaza say they are devastated over Israel’s deadly raid on an international aid flotilla bound for the Gaza Strip. “We are heart-sick and outraged about the brutal attack launched by the Israeli Military on the Free Gaza Movement’s flotilla of boats,” Cindy and Craig Corrie said in a statement. “The boats were carrying civilian passengers and humanitarian aid into the besieged Gaza Strip, and were clearly in international waters when this illegal attack occurred, in violation of international law,” they said. The number of dead and injured are still unconfirmed, but lowest figures reported are nine killed and 34 injured. Israel has not released their names. Over 700 citizens from nearly 40 countries were on board. Reporting from Haifa, Israel – The American parents sit stoically in a sky-lit courtroom, listening to testimony about how an Israeli military bulldozer crushed their daughter to death seven years ago. They hear about the dangerous game of chicken played for several hours that winter afternoon in 2003, between bulldozers and international activists trying to protect Palestinian homes, before Rachel Corrie disappeared under a creeping mound of dirt. Now her parents, calling an Israeli investigation that found no fault a “whitewash” and suspecting that the bulldozer driver deliberately ran over their daughter, are pursuing a civil lawsuit against the government. It opened this month in Haifa. 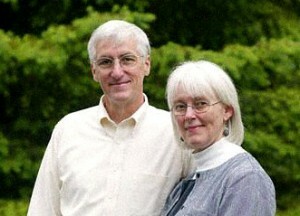 “We need to know what really happened,” said Cindy Corrie, mother of the 23-year-old college student from Olympia, Wash. But it’s a cause that has been met in Israel with indifference or, more often, hostility. When the Corries arrived for the trial opening, University of Haifa professor Steve Plaut called them a “two-person anti-Israel SWAT team.” On his website, the right-wing commentator likened Rachel Corrie to a Nazi sympathizer and accused her parents of exploiting the “suicide death of their clueless daughter” to launch a “pogrom” against Israel. One newspaper columnist called Rachel Corrie a “propaganda treasure.” Most Israeli media have ignored the trial altogether. On the streets outside the courtroom, there’s little sympathy. People point to the many Israelis who also have died, from suicide attacks and rockets. Even in the U.S., pro-Israel activists sometimes picket the family’s public appearances. 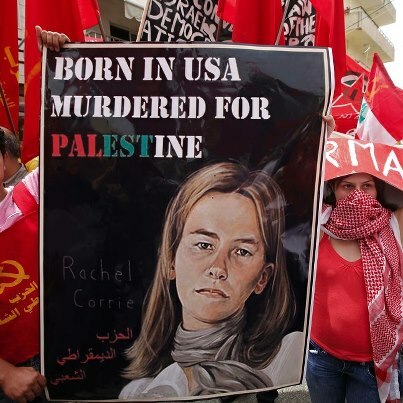 Last summer, opponents lobbied unsuccessfully to cancel Cindy Corrie’s participation in a panel at the San Francisco screening of the documentary “Rachel.” A New York production of the play “My Name Is Rachel Corrie” was delayed because of protests. Rep. Brian Baird (D-Wash.), who represents the Olympia area, said the family had been subjected to an ugly counter-campaign for pursuing their daughter’s case. He and others say it’s a pattern that’s increasingly common. “Any questioning of Israel is met with hostility, no matter who asks the questions — a congressman, a journalist or even the president of the United States,” said Baird, adding that his support of the Corrie family had cost him campaign donations. Mark Regev, an Israeli government spokesman, said much of the criticism in Israel is directed at the International Solidarity Movement, the pro-Palestinian protest group with which Rachel Corrie worked. In fact, some of the Israeli hostility toward the case may reflect how Palestinians have embraced the young woman as a hero. They dedicated a street in her name. Her parents started a foundation to support Palestinian causes. Baird compared her courage to that of the Tiananmen Square protester who faced down a Chinese tank in 1989. Many thought Corrie’s death would be settled out of court, given the close U.S.-Israeli relations and disturbing circumstances. But diplomatic efforts to resolve the case failed and Israel’s government insists that it bears no responsibility. An internal military inquiry concluded that the driver did not see Corrie and that the young woman should never have put herself in the middle of the Israeli-Palestinian conflict. The Corries accuse the Israeli government of stonewalling their case. The full military report, including video evidence, has never been publicly released, they say. This month, they learned that an Israeli autopsy doctor took tissue samples from Corrie’s body without authorization and then lost track of them. U.S. officials had to intervene when the Israeli government refused to allow key witnesses to enter the country to testify, officials said. Last week, the family learned that legal proceedings might be delayed until next year. Family members say Israel has never apologized. Shortly after the incident, an Israeli consul in the U.S. phoned the family and offered condolences, Cindy Corrie said. A few days later, he called to retract them, clarifying that he was speaking only personally. For Cindy Corrie, the hardest part has been the vilification of her daughter by critics who often portray the woman as an anti-Semitic supporter of violence. Seven years ago American peace activist Rachel Corrie was crushed to death by an Israeli bulldozer while protesting against the demolition of Palestinian homes in Gaza. Her parents are now suing the Israeli government. The trial got underway on the anniversary of her death. RT caught up with filmmaker Simone Bitton, who made it her mission to find justice. light the flame of freedom, boycott Israel, end apartheid! The parents of American activist Rachel Corrie, who was killed by an Israel Defense Forces bulldozer in Gaza, took part in a ceremony in Ramallah on Tuesday, where a street is being named after Rachel. The ceremony was attended by Palestinian anti-fence protesters as well as members of the International Solidarity Movement, the organization to which Rachel Corrie belonged. Later on Tuesday, Rachel Corrie’s parents were in Haifa to watch a biographical play about their daughter on the seventh anniversary of her death. The Corries were joined by dozens of others taking in the performance that tells the story of the young American woman who chose to disengage from her quiet life in the town of Olympia, Washington and travel to the southern Gaza Strip as a human rights activist. 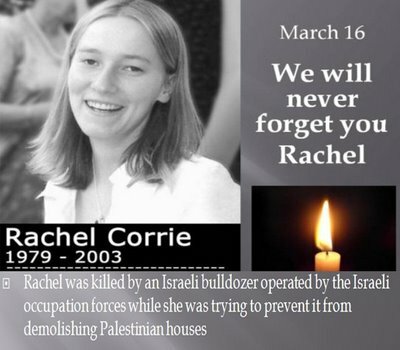 Corrie died on March 16, 2003 after she was trampled by an IDF bulldozer. Her family is in Israel to sue the state and the IDF over her death. The play, which is based on Rachel’s diary entries and e-mails she wrote since she was 10 years old, was first staged in London in 2005. The director of the play, Riad Masarwa, saw the London production and afterward contacted the rights holders, edited the script, and staged an Arab-language version of the play in 2007. Cindy Corrie, who noted that the play has already been staged in many countries, including the United States, said she found comfort in the fact that her daughter’s memory is being kept alive by means of words she herself wrote. Today 14 March 2010 the Haifa District Court saw the second full day of testimony in the civil lawsuit filed by Rachel Corrie’s family against the State of Israel for her unlawful killing in Rafah, Gaza. Rachel Corrie, an American human rights defender from Olympia, Washington, was crushed to death on March 16, 2003 by a Caterpillar D9R bulldozer. She had been nonviolently demonstrating against Palestinian home demolitions with fellow members of the International Solidarity Movement (ISM), a Palestinian-led movement committed to resisting the Israeli occupation of Palestinian land using nonviolent, direct action methods and principles. Dr. Yehuda Hiss, the former head of the Israel Forensic Institute who conducted the autopsy of Rachel Corrie at the request of the Israeli military, admitted that he violated an Israeli court order requiring that an official from the U.S. Embassy be present during Rachel’s autopsy. Hiss also stated that his policy was not to allow entrance to the autopsy to anyone who is not a physician or biologist. Dr. Hiss stated that he spoke by phone with the US Embassy after receiving the court order and was told they would not be sending a representative, and that the Corrie family had agreed to the autopsy. Dr. Hiss admitted there was no documentation in his file of this conversation with the Embassy. The U.S. Embassy has repeatedly told the family that this was not the conversation that occurred. Dr. Hiss also disclosed that he had kept samples from Rachel’s body for histological testing without informing her family. Dr. Hiss admitted that he did not inform the family about their right to bury the samples and that the samples were likely to have been buried with other body samples from the Institute, but he was uncertain. This was the first time that the family of Rachel Corrie received confirmation that the Israeli Forensic Institute had indeed kept samples of her body, despite prior attempts to receive this information. Dr. Hiss has been the subject of a prior lawsuit in Israel brought by families for whom he did not return body parts and samples. The judge granted the Corries’ request to expand their punitive damages request, to include the failure to ensure that a U.S. Embassy official was present during the autopsy. In response to the State’s demand, the judge requested that the Corries specify the amount of claimed punitive damages. The Corries set the punitive damages at the symbolic amount of $1, stating that the court’s pronouncement of accountability and preventing future harm to others was more important to them than money. The judge granted the Corries’ motion to allow into evidence the medical report of Dr. Ahmed Abu Nikera the Palestinian physician who pronounced Rachel’s death in Rafah, Gaza. The State agreed to the admission of this report only after the judge granted the Corries’ earlier motion to allow Abu Nikera to testify via video conference from Gaza. In Professor Hiss’s testimony, he stated that Abu Nikera’s medical report was consistent with his findings, including the statement that Rachel had arrived dead at the hospital. Today’s hearing also included the conclusion of Tom Dale’s testimony, a fellow ISM activist and eyewitness to Rachel’s killing. Today’s hearing was attended by several observers, including Andrew Parker, the U.S. Embassy Consul General and human rights representatives, including Lawyers without Borders, and the Association for Civil Rights in Israel (ACRI). Testimony will continue on March 15 from 9am-1pm, and on March 17 from 9am-4pm. Today, March 15, 2010, the Haifa District Court saw the third day of testimony in the civil lawsuit filed by Rachel Corrie’s family against the State of Israel for her unlawful killing in Rafah, Gaza. Rachel was crushed to death on March 16, 2003 by a Caterpillar D9R bulldozer. She had been nonviolently demonstrating against Palestinian home demolitions with fellow members of the International Solidarity Movement (ISM), a Palestinian-led movement committed to resisting the Israeli occupation of Palestinian land using nonviolent, direct action methods and principles. Today’s only testimony came from British citizen Alice Coy, a nurse, who was an eyewitness to the killing. The state spent most of the day trying to establish that contrary to all eyewitness accounts and human rights reports, the Israeli Military had no intention of demolishing homes in the area on the day Rachel was killed. – She first visited Israel in order visit Israeli family members. – When the Israeli Military interviewed her on April 1st about Rachel’s killing, the soldier who documented her testimony refused to record her statement that she believed the bulldozers were going to destroy civilian homes. – She believed the Israeli Military was planning to demolish homes on the day Rachel was killed because the Israeli Military had been demolishing homes on the Philadelphi Corridor in the days and weeks prior, and because they had already begun to demolish a house earlier that day by damaging its porch. – She had spoken with many Palestinian families in the area where Rachel was killed whose homes had been demolished by the Israeli Military. – She believed the bulldozer driver who killed Rachel could see her. – She described her view of her work with ISM as promoting peace for the whole region. The home Rachel Corrie was protecting, that of Dr. Samir Nasrallah, was in fact demolished by the Israeli Military later that year. According to an October, 2004 Human Rights Watch report, Razing Rafah: Mass Home Demolitions in the Gaza Strip (http://www.hrw.org/en/node/11963/section/11), between 2000 and 2004, the Israeli Military demolished over 2,500 Palestinian houses in Gaza, nearly two thirds of which were located in Rafah, resulting in more than 16,000 people – over 10% of Rafah’s population – losing their homes. The Israeli human rights organization B’Tselem, in its 2004 report Through No Fault of their Own, found that contrary to Israel’s claim that prior warning is given before a home is demolished, occupants were given prior notification in a mere 3% of the cases. The Human Rights’ Watch report further documented that most of the destruction in Rafah occurred along the Israeli-controlled border between the Gaza Strip and Egypt known as the Philadelphi Corridor, the area where Rachel was killed. During regular nighttime raids and with little or no warning, Israeli forces used armored Caterpillar D9 bulldozers to raze blocks of homes, incrementally expanding a “buffer zone” that is currently up to three hundred meters wide.The pattern of destruction strongly suggests that Israeli forces demolished homes wholesale, regardless of whether they posed a specific threat, in stark violation of international law. The trial will resume on Wednesday, March 17, 2010, at 9 a.m. at the district court in Haifa. Following the letter from Rachel’s parents is a video bringing you up to date with the situation…. (IDF) Caterpillar D9R bulldozer in Rafah, Gaza. families, harmed as deeply as ours, cannot access Israeli courts. 9:00-16:00 – Trial Begins in the Haifa District Court (12 Palyam St.
should be asked and addressed during the trial. (TBA), and around the world. you and your group/community can be visible/audible on March 16. Court begins hearing civil suit brought against Israeli government over death of US activist killed by Israeli army bulldozer in Gaza. A British witness told a court today about how he had watched an Israeli military bulldozer run over and kill the American activist Rachel Corrie while she was trying to stop Palestinians’ homes being demolished in Gaza. Richard Purssell, who was also a volunteer activist in Rafah at the time, seven years ago, described the “shocking and dramatic event” in an Israeli court in Haifa on the first day of a civil suit brought by Corrie’s family against the Israeli state. Twenty-three-year-old Corrie, from Olympia, Washington, in the US, went to Gaza for peace activism reasons at a time when there was intense conflict between the Israeli military and the Palestinians. The Corrie family lawyer, Hussein Abu Hussein, said he would argue that her death was due either to gross negligence by the Israeli military or that it was intended. If the Israeli state were found responsible, the family would press for damages. On the day of her death, 16 March 2003, Corrie was with seven other activists, including Purssell, in Rafah, close to the Israeli-guarded border with Egypt. They saw an Israeli military armoured Caterpillar D9 bulldozer approaching the house of a Palestinian doctor. Purssell described how the bulldozer approached at a fast walking pace, its blade down and gathering a pile of soil in its path. When the bulldozer was 20 metres from the house Corrie, who like the others was wearing an orange fluorescent jacket, climbed on to the soil in front of it and stood “looking into the cab of the bulldozer”. The bulldozer continued forward four metres as the activists began to run forward and shout at the driver. “It passed the point where Rachel fell, it stopped and reversed back along the track it first made. Rachel was lying on the earth,” Purssell said. “She was still breathing.” Corrie was severely injured and died shortly afterwards. The Israeli military says it bears no responsibility for Corrie’s death. A month after her death the military said an investigation had determined its troops were not to blame; the driver of the bulldozer had not seen her and had not intentionally run her over. It accused Corrie and the ISM of behaviour that was “illegal, irresponsible and dangerous”. Hussein will argue at the Haifa district court that witness evidence shows that the soldiers did see Corrie at the scene, with other activists well before the incident, and that they could have arrested her or removed her from the area before there was any risk of injury. Cindy Corrie, Rachel’s mother, said the family was still waiting for the credible, transparent investigation Israel first promised regarding her daughter’s death. “I just want to say to Rachel that our family is here today trying to just do right by her and I hope that she will be very proud of the effort we are making,” she said. She said the family had met the staff of US vice-president Joe Biden on Tuesday to talk about the case. Three other witnesses, two more Britons and an American, who were all at the scene in Rafah when Corrie was killed will give evidence at the Israeli court. It is not clear if any Israeli military officials will speak. The hearing is scheduled to run for at least two weeks. Seven years after Rachel Corrie, a US peace activist, was killed by an Israeli army bulldozer in Gaza, her family was to put the Israeli government in the dock today. A judge in the northern Israeli city of Haifa was due to be presented with evidence that 23-year-old Corrie was killed unlawfully as she stood in the path of the bulldozer, trying to prevent it from demolishing Palestinian homes in Rafah. Corrie’s parents, Craig and Cindy, who arrived in Israel on Saturday, said they hoped their civil action would shed new light on their daughter’s killing and finally lead to Israel’s being held responsible for her death. They are also seeking damages that could amount to millions of dollars if the court finds in their favour. An internal army investigation was closed shortly after Corrie’s death, exonerating both the bulldozer driver and the commanders who oversaw the operation. Three Britons and one US citizen, who were standing close to Corrie when she was killed, are expected to challenge Israel’s version of events, arguing that the bulldozer driver knew Corrie was there when he ran her over. The Israeli government had sought to block the activists from entering Israel for the hearing but finally relented three weeks ago, when Britain and the US exerted strong pressure. The four, like Corrie, belonged to the International Solidarity Movement (ISM), which brings activists to Israel to resist the occupation non-violently alongside Palestinians. For many observers, Rachel Corrie’s death in March 2003 rapidly came to symbolise the injustices of Israel’s occupation. Diary entries, many of them written while she was living with Palestinian families, were adapted into a play that has been performed around the world. Corrie’s family hopes the court case will rectify that. Rachel, a film released last year about her life and the events in Rafah, is due to be screened in Tel Aviv on March 16, on the seventh anniversary of her death and in the midst of the legal proceedings. Until the court case in Haifa, the Corrie family had run into a series of administrative and legal brick walls in trying to get their daughter’s death independently investigated and to hold those responsible to account. Ariel Sharon, the Israeli prime minister at the time of Corrie’s death, promised a “thorough, credible and transparent investigation” would be conducted. But an internal military inquiry clearing the two soldiers operating the bulldozer was widely criticised, including by US officials. Human Rights Watch said it “fell far short of the transparency, impartiality and thoroughness required by international law”. The army’s report claimed that Corrie had been “hidden from view” behind a mound of earth and that the bulldozer had never come into contact with her. It concluded that “Corrie was struck by dirt and a slab of concrete” as earth slipped on top of her. The four former ISM activists due to appear in court this week have been told not to comment before giving their testimonies. But previous witness statements, backed by photographic evidence, have questioned the army’s account. Photographs show Corrie, wearing an orange fluorescent jacket and holding a megaphone, confronting the bulldozer over several hours. They also show the bulldozer’s track marks over Corrie’s body moments after she was crushed. Tom Dale, a British activist who was next to Corrie when she was killed, wrote two days later that she had climbed on top of a mound of earth as activists nearby shouted at the bulldozer driver to stop. In 2007 a US court denied the Corrie family the right to sue the Caterpillar company, which supplies the Israeli army with the special D-9 bulldozers that killed their daughter and that Israel regularly uses to demolish Palestinian homes. This week’s hearing is the outcome of a private lawsuit filed by the Corries in March 2005, at the suggestion of the US state department. Mr Corrie added that the family had had to endure “lies and misrepresentations” about the circumstances of their daughter’s death. The family also accused Israel of resorting to procedural delays to drag the case out. Although Israel has agreed to let in the four ISM witnesses, it has refused to allow Ahmed Abu Nakira, a doctor in Gaza who treated Corrie, to attend the hearing or to be questioned over a video link. The lawsuit accuses the Israeli government of being responsible either for Corrie’s intentional killing or for the negligent conduct of its soldiers towards unarmed demonstrators. Israel claims it is not liable because the army’s actions were “acts of war” and because Corrie recklessly endangered herself. Around the time Corrie was killed, three Britons — Iain Hook, Tom Hurndall and James Millar — were fatally shot by Israeli soldiers. Only in the case of Hurndall, another ISM volunteer who was shot in Rafah a month after Corrie, did an investigation lead to a soldier being found guilty and jailed. Hussein Abu Hussein, the Corrie family’s lawyer, said they were seeking $324,000 compensation for specific costs related to Corrie’s death, including the funeral, legal expenses and flights. In addition, the family will ask for general compensation for their suffering and Rachel’s loss of earnings, and punitive damages from the state. In recent weeks the ISM’s office in the West Bank has been raided several times by the Israeli army, with computers and documents taken. Mr Abu Hussein said he would be arguing in court that the D-9’s manual specifically states that work must not be carried out with civilians nearby, and that the state ignored a judicial decision that a US embassy representative be present at Corrie’s autopsy. Also view this short video…. As many of you know, a civil lawsuit in the case of our daughter Rachel Corrie is scheduled for trial in the Haifa District Court beginning March 10, 2010. A human rights observer and activist, Rachel, 23, tried nonviolently to offer protection for a Palestinian family whose home was threatened with demolition by the Israeli military. On March 16, 2003, she was crushed to death by an Israel Defense Force (IDF) Caterpillar D9R bulldozer in Rafah, Gaza. The lawsuit is one piece of our family’s seven-year effort to pursue justice for our daughter and sister. We hope this trial will illustrate the need for accountability for thousands of lives lost, or indelibly injured, by occupation—in a besieged and beleaguered Gaza and throughout Palestine/Israel; bring attention to the assault on nonviolent human rights activists (Palestinian, Israeli, and international); and underscore the fact that so many Palestinian families, harmed as deeply as ours, cannot access Israeli courts. In order to deliver these interconnected messages as effectively as possible, we are asking for large-scale participation in the trial itself as well as in the events surrounding it. We hope you will join us for all or some of the events listed below and help us to put the call out to others. A strong presence of human rights observers, legal observers, and others on the first day of the trial will send the message that this case is being closely monitored and that truth, accountability and justice matter to us all. Other trial dates are: March 14, 15, 17, 21, 22 and 24. Supportive presence at all court sessions is both welcome and needed! Screening of the documentary film RACHEL followed by a Q&A with filmmaker Simone Bitton and the Corrie family. RACHEL is a cinematic inquiry into Rachel’s killing. It raises many of the questions that should be asked and addressed during the trial. March 16th marks the seven-year anniversary of Rachel’s killing. We hope to mark this day as a “Day of Conscience” with a large gathering that calls for truth, accountability and justice, in Rachel’s case and beyond. There will also be events in Gaza (at the Rachel Corrie Children and Youth Cultural Center in Rafah), possibly in the West Bank (TBA), and around the world. If you are not with us in Palestine/Israel, please think about how you and your group/community can be visible/audible on March 16. We expect this to be a challenging time, but we know the friendship we have felt from so many of you over the years will help us navigate the weeks ahead. Though the course and outcome of the trial are unknown, we welcome the opportunity to raise and highlight many of the critical issues to which Rachel’s case is linked. Thank you for your continuing support.